Great people are godly radiating the grandeur of the Divine with a touch of magic. They change adversities around them into opportunities, for they are citadels of courage and people of vision. Mother Piera Silvestrini was certainly a woman of extraordinary courage and vision. Born in Italy, the eternal city, of noble parents, brought up in a sound Christian faith, she dedicated her life for the service of humanity with a profound love for God. She heard the call within a call and responded positively. Leaving her country, kith and kin, travelled to a distant land, to a new people, new language and culture in 1975 to be a mother, a sister and a friend to many of us. With undaunted strength and unfailing confidence in the Divine providence she faced all the initial difficulties. Being at the helm of the province she rowed province to a safer shore and left for Italy in 2002 to take up her office in the general administration. We are sure that she would be the happiest person always to know the how about of Indian province. The province owe a lot to her. We wish and pray that her graceful old age be full of sweetened memories of her beloved Indians. 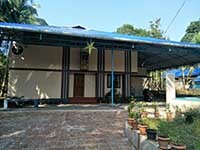 Venerini Provincial house is situated in Cheruvannur, Feroke,Calicut district in Kerala. It is the mother house of Indian mission. The house is under the jurisdiction of Sacred Heart Church Cheruvannur of the diocese of Calicut. The province is with 155 professed members and 22 houses spread out in 5 states and branches out to ten dioceses. In our educational ministry, we include schools, catechesis in parishes and villages, residential school for the visually handicapped, village developing programme, women empowerment, adult literacy programme, village healthcare dispensaries, rehabilitation centers for the leprosy patients, vocational training centers in remote villages, youth animation, pastoral ministry, prison ministry and animation of pious organizations etc. In all these activities the mission of education is carried out with much apostolic thrust because the initiative of Rosa was indeed a decisive step in the field of education. Education has always been a process of developing an ability to free the mind from the narrow walls of ignorance, dependence, indecision and hopelessness. Ignorance is one of the greatest enemies of mankind. Mere acquisition of knowledge contributes nothing to life. Knowledge with wisdom and values of life would develop human beings socially harmonious and spiritually rich. The soul of education is missing in the present era. The floodgates of technology flaws to educational institutions. We seldom find a highly learned, spiritually developed or morally upright man. Today the role of school is to impart knowledge that encompasses not only the prescribed syllabi of the institutions but also the world beyond the classrooms. The role of the school is to build and strengthen character of its pupils that will not crumble when tested in the crucible of adulthood, and to develop qualities of good leadership that can be employed in the future for the making of a stronger nation. With the motto ‘Educate to set free’ we aim at the intellectual, mental, physical, emotional, cultural and spiritual development of the whole person. It is our constant endeavor to shape well-rounded personalities that will contribute positively to the world around them. Born in Mumbay, India, she made her religious profession in Italy. She is one of the pioneers to Indian mission. She is a born educator and the founder headmistress of Venerini schools in India. An inspiring teacher is ever young and vibrant even in her late seventies. She shares the birth pang of indian mission with mother PieraSilvestrini and a few others. She spent her time in visiting families of Cheruvannur locality to know the need of the people around. Reading the signs of the time and feelingthe pulse of the place she paved way for education which is the gate way of human formation. She served the Indian mission from 1974 to 1991, specially in the educational ministry, giving it a strong foundation with much dedication and far vision. Towards the end of 1991 she opted for African mission since her broad mind and vibrant spirit felt the urgency of her missionary presence in Cameroon. The Lord who foresees everything in everyone found her generosity and efficiency to be used for leading the entire congregation and thus she was elected as a general councilor in Rome 1995. Then in 2004 she returned to her homeland and in her late seventies she is an inspiration to all of us. She is a powerful support to each one of us through her prayer and words of appreciation. The second community of the province was blessed in 1984 to commemorate the 10 th anniversary of the arrival of Venerini sisters in India under the initiative of Rev. Mother Piera Silvestrini and was blessed by Rt.Rev. Aldo Maria Patroni the then Bishop of Calicut. Though the school provided education only for girls in its initial stage, the demand of the time made us to think further and thus now it provides co-education to the students where boys and girls of the locality get their basic education. Through the charism ‘Educate to set free’ we aim at quality education and desirable holistic competence in the students. We aim at general formation and development of the total person, being aware of the natural and spontaneous rhythm of intellectual, mental, social and cultural growth in them. The dedicated effort of the staff both teaching and non-teaching and the admirable performance of the students in curricular and extra-curricular activities bring laurels to the school. 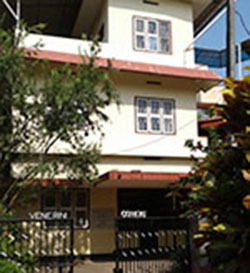 We provide hostel facility for the girls who come from distant place to be educated in our school. We extend our service in the pastoral activities of the parish, catechism, family apostolate, youth animation pious associations etc.. .
We opened a new community in St. Antoney’s parish Thayyil, Kannur diocese in 1990. It is a coastal area where fishermen, Migrated Magalorian Catholic community and people of all faith live together harmoniously. This venture is another initiative of Mother Piera at the invitation of Rt. Dr. Maxwell Nerohna the Bishop of Calicut diocese. Sisters offer their dedicated service to people of different faith, caste, and creed. The forms of apostolate they carry on are catechism, family apostolate, Basic Christian Community, Jail ministry, pious Associations, youth animation, formal and non-formal education etc…. 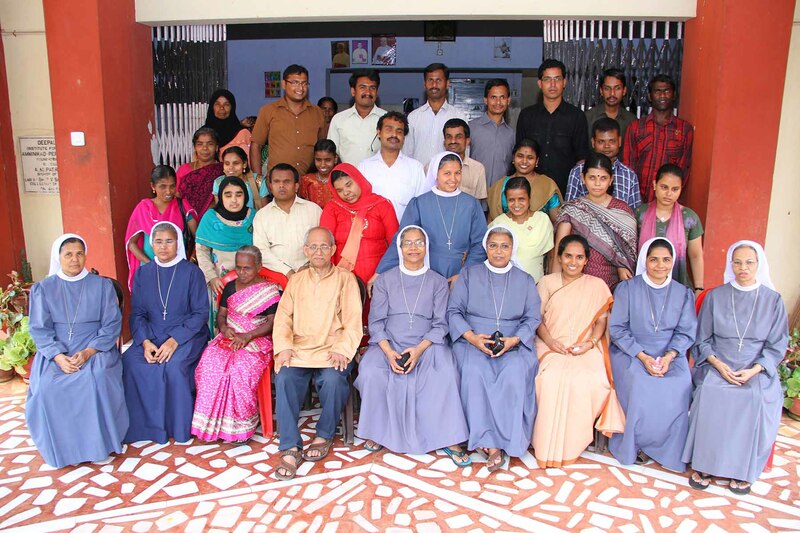 Apostolate in Deepalayam was a new venture for the Venerini mission in India. Rt.Rev.Dr.Maxwell Nerohna the then Bishop of Calicut requested Rev.Mother Piera Silvestrini to look after Deepalayam which belongs to the diocese, where only blind children are being educated. Filled with the spirit of the foundress Rosa Venerini and love for the children, Mother Piera immediately responded to the invitation and with her foresighted vision she sent sisters for training to be equipped with the necessary qualification for this new mission. 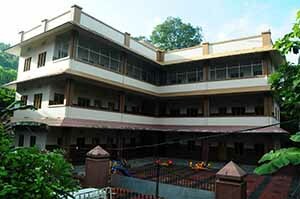 Thus in 1990, sisters were sent to Deepalayam, Perinthalmanna to take up the teaching and management of the school. Since it is a residential school, sisters are in charge of their entire formation like physical, spiritual, mental, intellectual, social and cultural. Children feel at home with the sisters. Classes up to VII is held in Deepalayam and the students are sent to other schools with sighted children for further education. Special coaching is given in extra-curricular activities to develop their innate talents. Beside this noble ministry, we are engaged in pastoral ministry, faith formation, family apostolate etc.. . All that we dream for the mission is that may the Lord continue to light up the darkened lines of these visually impaired children and brighten their inner sight to face the challenges of daily life. As the name indicates, Kattakulam is a place surrounded by water. It is an interior village under the jurisdiction of Kannur diocese situated away from the National Highway Kannur to Mangalore. The then provincial superior Rev.Sr.Brigit Vadakkepurackal with the support of her council responded to the invitation of Rev.Fr.Jacob Jose who was the parish priest of Thavam, for the service of the people of Kattakulam, a sub-station of Thavam and he found a small house for the sisters. 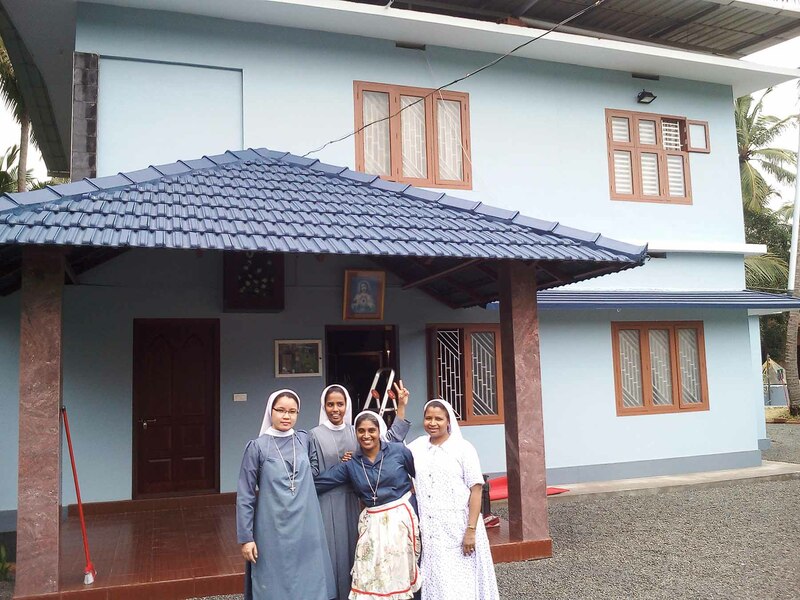 This is the house where Rev.Fr.Joseph Taffarel S.J the well known saintly missionary lived for some time during his ministry in Kannur diocese. People of the area belong to all sections, faith, caste and most of them are very poor. Though the place was not very convenient for a religious community, the sisters readily said ‘yes’ to the call of God who longed for spiritual and communal animation of the people. 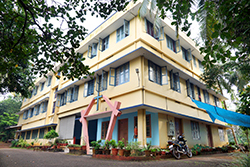 The convent was blessed by Rt.Rev.Dr.Varghese Chakkalackal the then Bishop of Knnur in 2004. The main apostolate of the sisters is pastoral work, faith formation and family visit and prayer. We work hand in hand with the parish priest in all matters, changing all the inconveniences of the place into blessings for us and for the people. The community at Naranganam was a wonderful gift to the province because it was born in the year 2006, the year when our mother foundress Rosa Venerini was raised to the glory of saints. It was indeed a unique vision and a new entry to extend the charism to Syro-Malabar Church. At the request of the then parish priest of Kozhencherry Rev. Fr. Denny Nedumpathalil and the invitation of the Bishop of Kanjirapally diocese, the then provincial Rev. Sr. Theresa Chandy sent a group of three sisters to join the existing Savio English School of the diocese. Sisters stayed in a house attached to the school building. They contributed their best in the education ministry. In 2007, we purchased the whole property, thus the ownership and the management of the school became of the province. The constant support of the Bishop and the priests of the diocese, the co-operation of the parents and well-wishers and the confident effort of the staff and students were really encouraging to carry on the charism ‘Educate to set free’ faithfully. Sisters are involved in pastoral activities such as catechism, youth animation, pious organizations and family apostolate. We have extended our service to two other new fields such as taking care of the hostel of Plus Two girls in St. Antoney’s Higher Secondary School in Anackal and the spiritual animation of the Malanadu Development society which belongs to the diocese. All that we wish is the spirit of Rosa Venerini our foundress may lead us forward to an ever widening thought and action to take part in the salvific mission of the Lord. It was a long cherished dream of the province to have an independent novitiate house for the formation of the novices and it had come true in 2011 by the constant effort of the then provincial superior Rev. Sr. Theresa Chandy and her council. It is located in Thrikkalangode, which is a sub-station of Manjeri parish. The beauty and calmness of the site is very attractive and prayerful. The house can accommodate good number of persons and therefore province level retreats, seminars and assemblies are conducted here in this house. The community is consisted of four sisters and the group of formees. Beside formation program, sisters are involved in pastoral ministry, catechetical field, home mission, and family visit and prayer services. How good and delighted to live together all united!! Love and friendship have a power and can bring joy and new hope to all. Mission in Kunnoth, Iritty of Thalasserry diocese began with the sole purpose of family apostolate which is a necessary need of the time. It was in 2012 the province under the leadership of Sr. Theresa Chandy the then provincial superior with the support of her council took up this new venture. Sisters are actively involved in the pastoral ministry, catechetical field, house visiting and family prayer services. Old and sick in the families are attended, listened and comforted by the very presence of these sisters and words of consolation. Two sisters are engaged in the educational ministry in Ben Hill school run by the Benedictine monks. Happy indeed are we, for being used for the noble ministry of the Lord!. It was in 2011, we opened a new mission station in Chembur in the diocese of Neyyatinkara. God in his great mercy listened to the cry of His people in Chembur and as an answer to their cry send the Venerini sisters to them whom He predestined would do good. It is a thickly populated area with different Christian denominations, yet the catholic s are outstanding in number. Most of them belong to Nadar caste. Sisters are involved in Faith formation, family apostolate, prayer services in families, youth ministry, organizing parish pious associations etc…. We thank God for using us to His mission among His chosen ones. As we go ahead with the ministry of the Lord, we do experience God’s providence, protection and care through the people around us. Pullur community is under the jurisdiction of Kannur diocese and in the district of Kasergod district. Area is thickly populated by Hindu brethren. Sisters are engaged in the educational ministry of the diocese. We do work hand in hand with the parish priest in faith formation, youth animation, organizing pious associations and family unit prayers etc…sisters visit the families of students in the school and thus finding an entry for family apostolate. The presence of sisters in this area make a lot of difference.